Restaurants: Don't leave us in the Vacation Home when it's time for dinner. A dog's gotta eat too! Wendy and I can point you towards a great sidewalk cafe, the very best of Santa Fe’s high-end restaurants, New Mexican restaurants, a brew pub, a coffee shop, a steak house (which seems to be a real favorite of our Texas visitors and mine too) or other eateries that will not only welcome us, but will gush all over us, want to pet us, and tell us how cute we are. Of course they will bring us water while we patiently wait for left- overs. It is kinda hard sometimes because as we have to be on our very best behavior. We have to lay down the whole time. No begging... ever, no barking, no sniffing, no pulling on the leash. I try to just roll up in a ball and go to sleep under the table, but it’s hard with all the wonderful smells. Also, everybody wants to pet me, and if I wag my tail Wendy gets mad because I am so big I can knock something over. So, Wendy trained me really well and that’s why I can go with her. I do have my favorite, dog friendly restaurants and patios. Some are a lot more hectic than others. Make sure your master knows how much stimulation you can handle before picking out the best place for you. 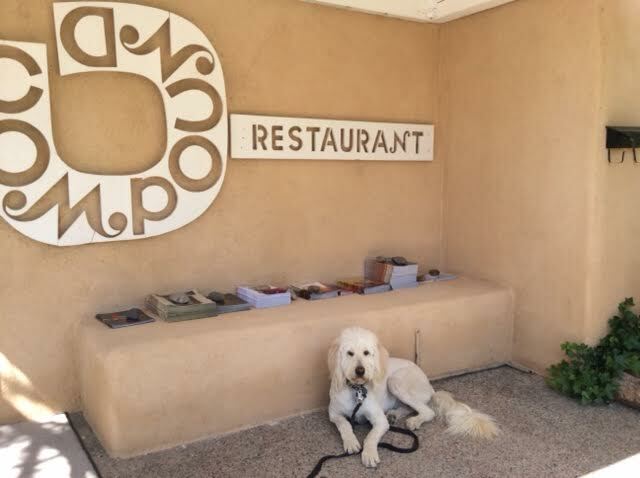 There are so many pet friendly restaurants in Santa Fe that it would take you several visits to try them all, but that means more variety for your human and you. Bone appetite! If you get exhausted, like me from a very long day of hiking, sometimes your owners might want to go out by themselves. They can bring you back some of the best left overs in town while you relax on your own patio at your Two Casitas Rental. Ahhh-alone at last! Below are two restaurants that you can send them to that are NOT dog friendly. Above you can see me with my grandma, famous Santa Fe artist Phyllis Kapp, at Geronimo’s restaurant. Geronimo’s is one of the most bragged about restaurants in Santa Fe; located right on Canyon Road. I just had to show you this picture of grandma and me. 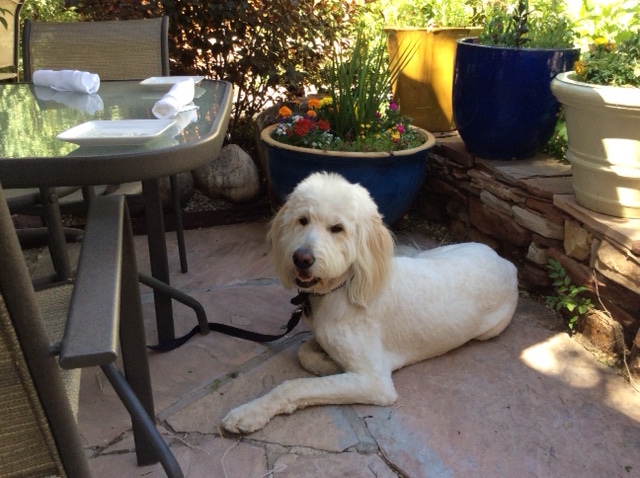 Only because I was with grandma did they let me sit down at the patio for this photo op. 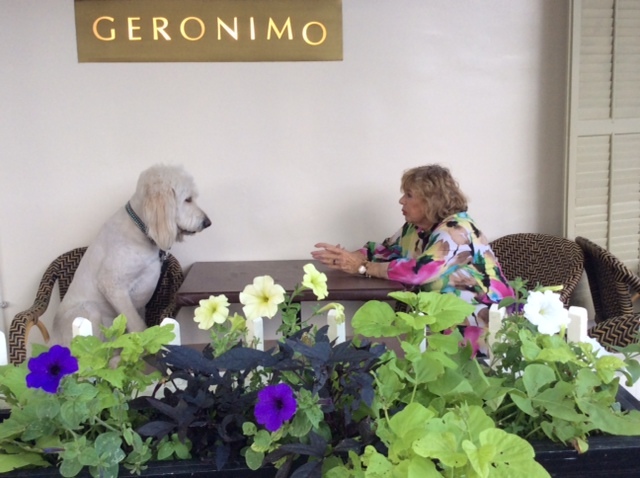 It’s not actually dog friendly at Geronimo’s restaurant, but grandma and I are special, so they let us sit and talk for a little while. At The Compound, across the street from Geronimo’s, I waited outside so Wendy could double-check for you guys if we could get into what she says is such a relaxing and romantic patio. She really wanted to take me, but it turns out they are kinda dog snobs and I will just have to enjoy left-overs. So, here I am waiting outside. Ok moving onto dog friendly places! Right next to Geronimo’s, on Canyon Road, is the oldest bar in Santa Fe. We love this place and Wendy goes there at night some times with out me for dancing. It’s called El Farol. I hear they have scrumptious Tapas, which mean small dishes in Spanish, but that also means no left overs. However, the patios are very pleasant. We settled in at the back patio as it was more comfortable for me. While we are still on Canyon Road, lets talk about The Teahouse. Man o man do I love it here and it’s not because of the food; it’s the patio. It’s spacious and other dogs are always hanging out here too. You can find shade if you want or sun yourself. It’s just a real cool place to be. The humans say the food is very good. Its all made to order, so we get to hang for awhile and chill. The teas come from China, India, Japan, Sri Lanka, and Santa Fe- where they create their own flavored teas. 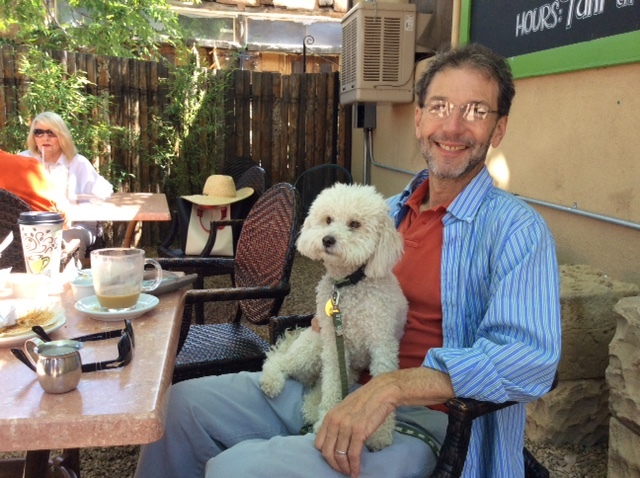 Here is a photo of a happy Santa Fe tourist and his little poodle. Very cute don’t you think? Here we are at our very favorite, New Mexican restaurant. The Shed is so much fun! 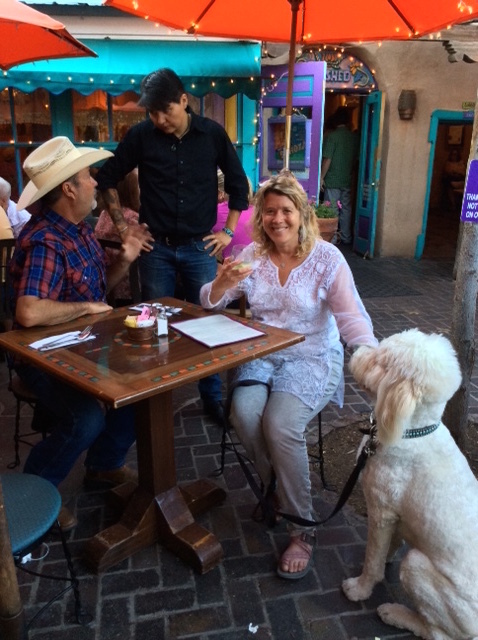 It can be hard to get into and the patio is sometimes hectic for us, but it’s worth it, because our owners are so happy after they drink the margaritas. 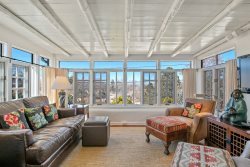 The good news is even if they are a bit tipsy, they can walk us home to the vacation rental as this joint is right on the Plaza and within walking distance to most of Two Casitas houses! I hear the flat-blue corn enchilada with cheese, red chilli, and a little sour cream is awesome. Personally, I have never tried it. The chilli is too hot for me. Right next-door from the Shed is the high-end, sophisticated restaurant La Casa Sena. With its innovative chefs, the setting of big trees and gardens; the historic building of La Casa Sena is amazing. You will see for yourself if you are lucky enough to go. It has the most beautiful, pet friendly, patio in town with plenty of room to spread out and watch the birds while your owners talk and talk. Of course we have to be quite, but it's very relaxing. They let me play with this little boy for a while after we ate. Man, did I make him happy. Now for one of the most fun joints in town, The Cowgirl Hall of Fame! Wendy’s friend, who is from Kewa Pueblo (which is just a half hour drive from Santa Fe) and I are featured in this photo. 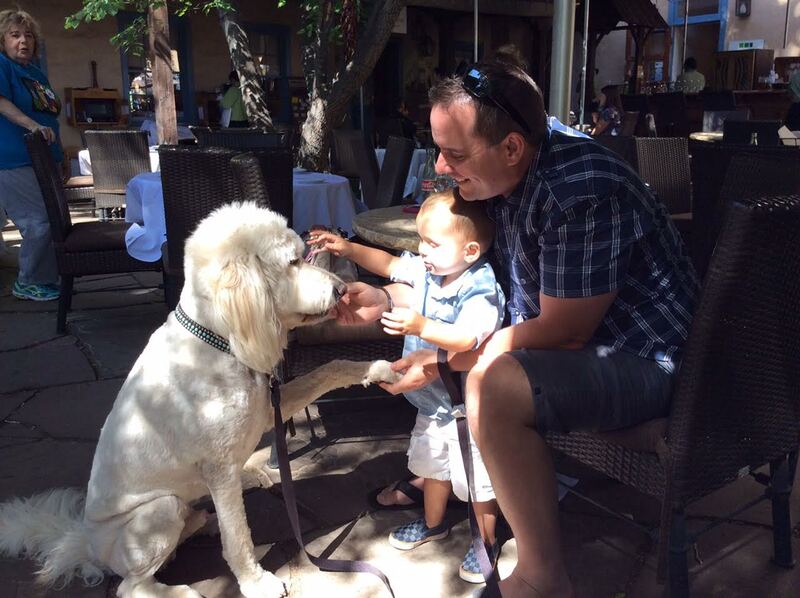 Not only is The Cowgirl Hall of Fame pet-friendly, it’s kid-friendly too. It features a varied menu, my favorite of course is the barbeque! The patio is a bit crowded, although this can add to the fun if you are up for it. I always run into friends here because they have great music and have lots of locals and visitors coming to eat, drink, and dance. It’s right in the Rail Yard, so you will get to walk here as well. The Pink Adobe Patio; man oh man is this a great place! 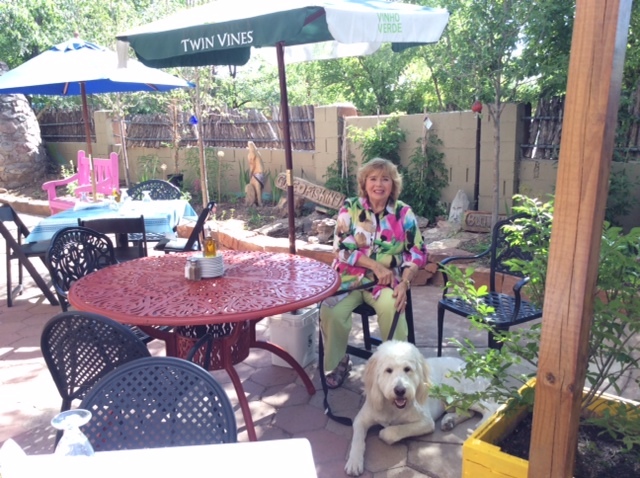 Wendy says it’s one of her very favorite dog-friendly patios, because we both like the atmosphere and the menu. For breakfast and lunch you can lay down at the very same patio, but enjoy the Guadalupe Café menu. I don’t like it as much as the evening’s steak dungegon; Wendy always orders the Southwest chicken salad and never gives me any. She says I don’t like salad. 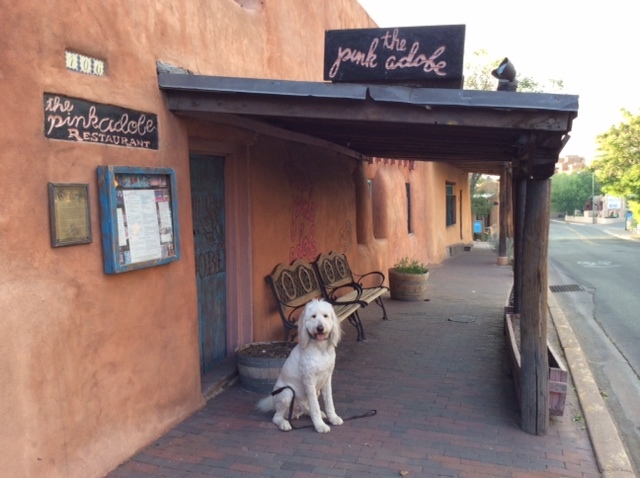 The Pink Adobe is one of the oldest, fanciest restaurants, established in 1944. The locals like to call it “The Pink” and say it's a national landmark. The cuisine is inspired by Louisiana-style cooking with a Southwest kick. Fancy, shamncy; Restaurant Martin in the Rail Yard is spacious and luxurious. Here, I truly can relax. It’s so good here that I don’t even get left overs. Check me out chilling once again. This is how they want you to behave. It has refined, modern American dishes served in a contemporary, artsy, space with a garden-lined patio. Three blocks from our home/office or a seven minute drive North of Santa Fe is the little village of Tesuque. 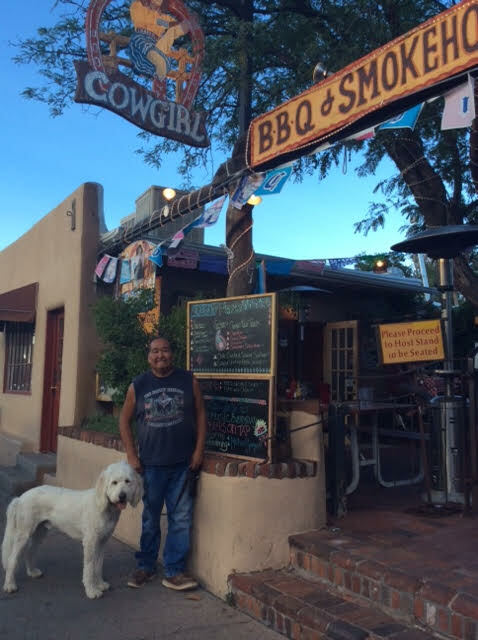 The Tesuque Market is where the regulars hang out along with a lot of other local dogs. We always tell our visitors to check it out if they have the chance. 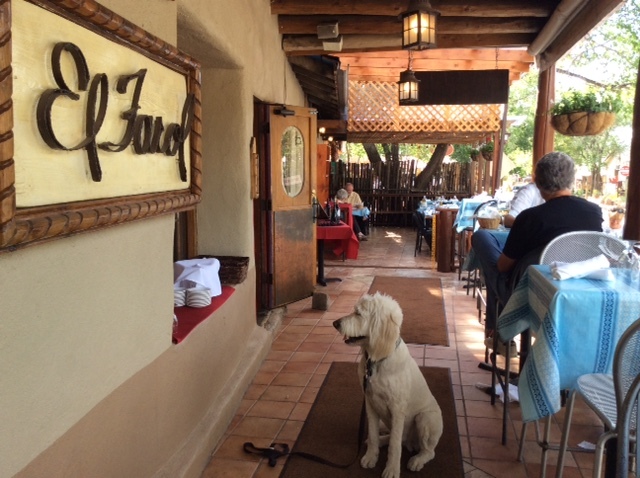 Tesuque Market has the friendly atmosphere of “Cheers” and I always get a dog biscuit here. They have New Mexican local fair and some say the best, oven baked pizzas in the area. Plus they have a funky, little grocery store in back for the humans. There are hiking trails around here, ask Wendy about her favorites, as she has explored this area thoroughly. I am one happy dog to live in a community with get this- no leash laws! Dinner on the patio at Gabriel’s is one of the best ways for me to enjoy our beautiful summer evenings. The smell of chicken fajitas and tender pork are enough to drive me crazy. This is such a gorgeous and spacious patio. Every time I go the humans are always talking about the scrumptious table-side guacamole. When I listen to Wendy talk to your family about Gabriel’s, you might be under the impression that it is one of the best Mexican and Southwestern restaurants in all of New Mexico. To me the best part is the spacious patio with its fountains, colorful flowers, and spectacular view.